Here’s a question: what’s the difference between soul food versus comfort food? I’ll answer that with my own little approach: I feel that soul food has it’s own fine definition of southern cuisine, whereas comfort food is more personalized per person. Two people could look at cornbread & fried chicken as soul food, however one person might find chilli as their comfort food while the other finds mac & cheese as their comfort food. 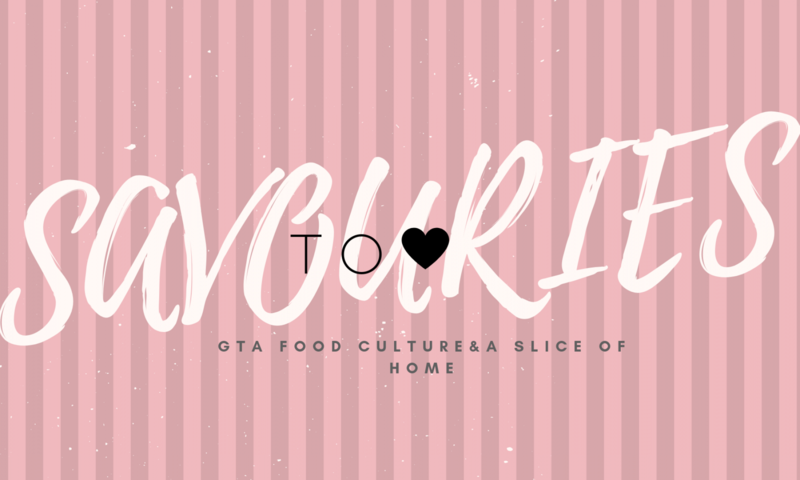 Point being, soul & comfort food are two fine lines, so how to make the two converge? 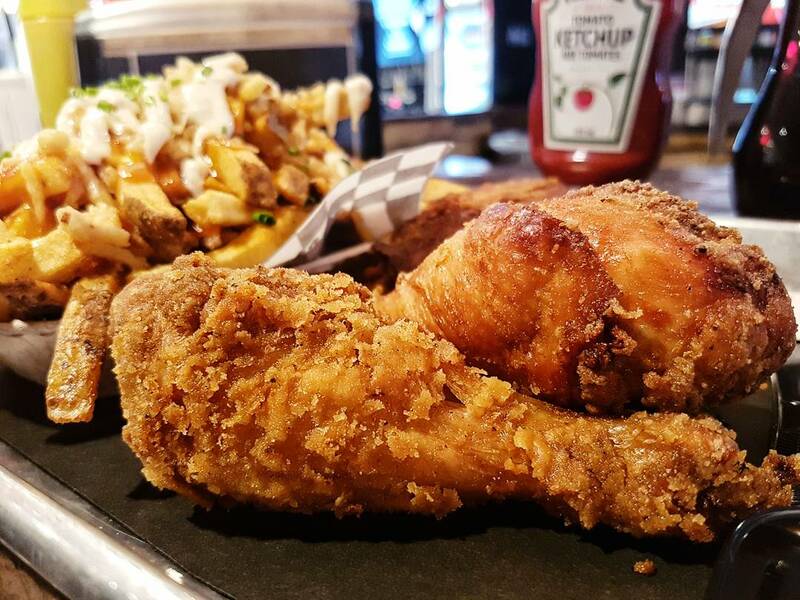 Toronto restaurant “The Dirty Bird Chicken + Waffles” seems to have figured out just that. 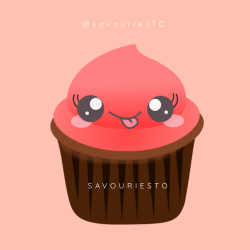 The restaurant has two locations, 79 Kensington Ave or 527 Bloor St West. I had a chance to visit the Bloor location, staff was a little quiet but it was understandable considering it was just opening hour. The atmosphere was quiet, not too much hustle but again, it was quite early in the day. With plenty of seating, the decor was fresh and modern, definately the sign of a toronto restuarant. Now for the main attraction, foodwise, the menu had plenty of options We opted for their 2 pc meal that comes with a side choice of mac salad, coleslaw, housecut fries, or potato salad, all for the price of $7. 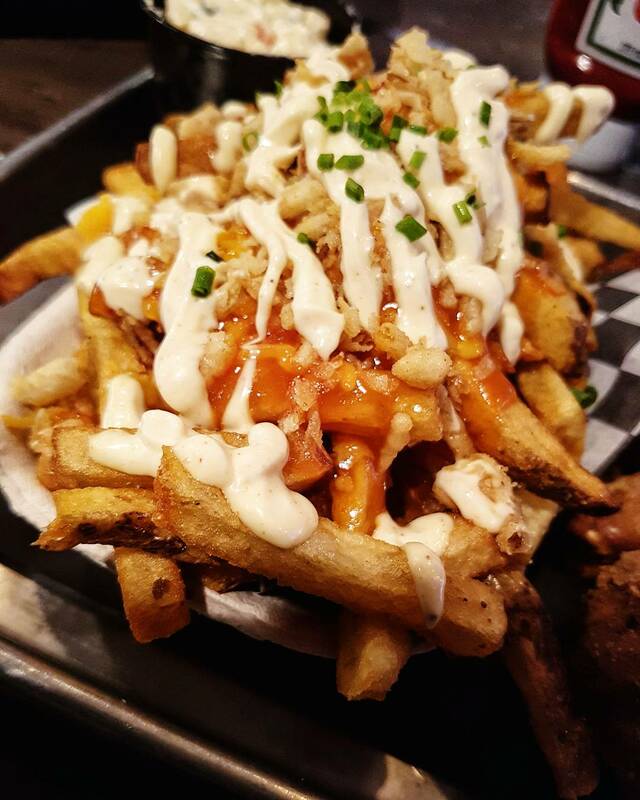 We also opted for their infamous Dirty Fries, which is a MUST TRY (you’ll thank me later). 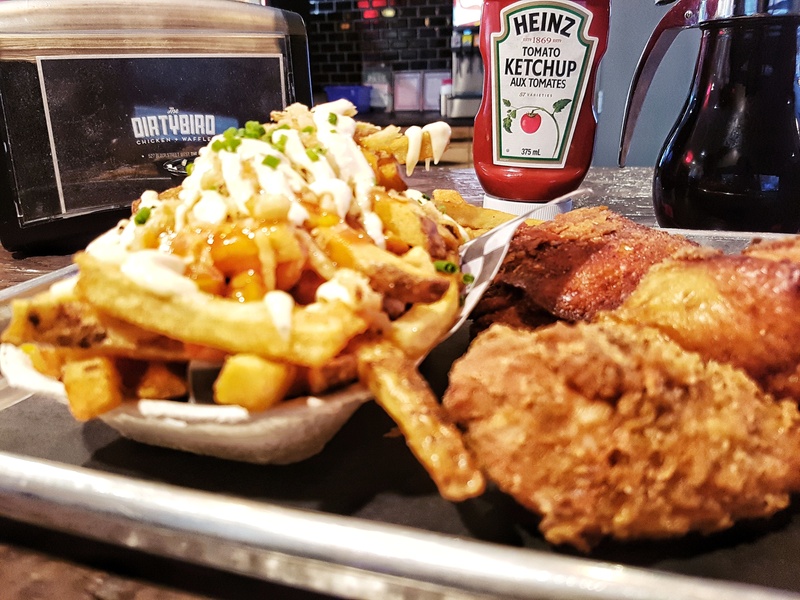 Their menu is most popular however for their waffle specials, such as their buttered maple waffle, a perfect pair for any fried chicken meal. Overall, if you think you deserve to go out for treat on your cheat day, this is definately the spot to do so. 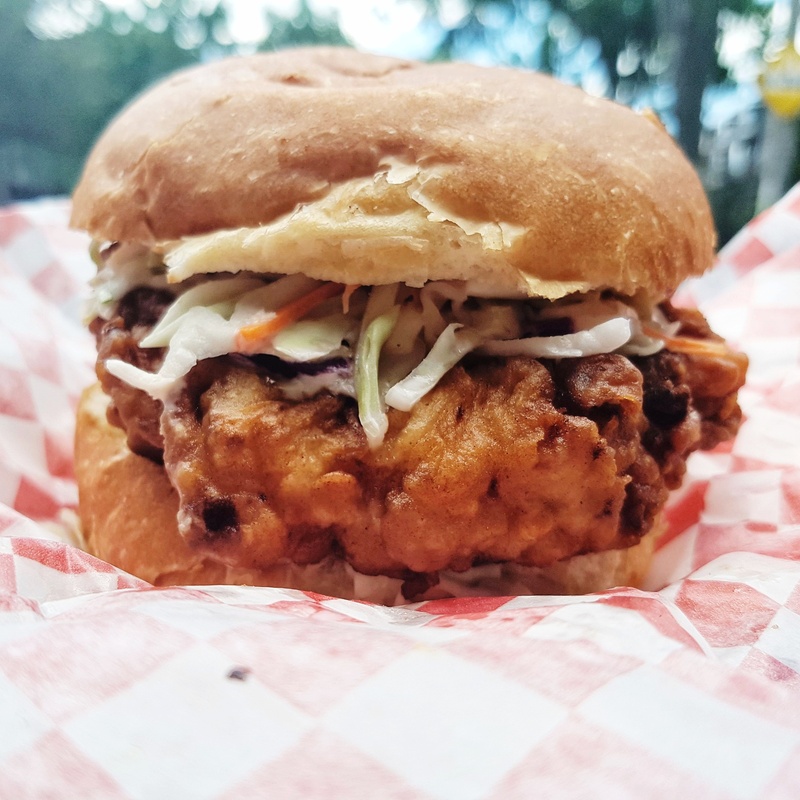 This eat is approved by yours truly – S.
Toronto’s always a busy scene for burger spots. That’s undeniable with the amount of instagram pages dedicated JUST for burger spots. Would it really be North America if we didn’t have the burger? However recently, we’re starting to see a trend on a whole new variety of burgers that really switch up the game, for example the sushi burger. Just like so, I had the chance to visit a farely low profile burger spot that specialize on burgers with a twist. 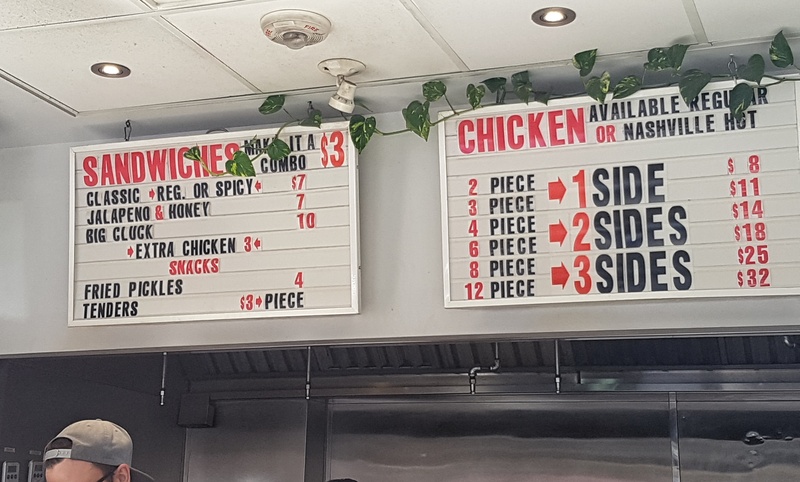 I say low profile due to the shop’s deceivingly small size but the never ending lineup of customers speaks for itself on the quality of the food. 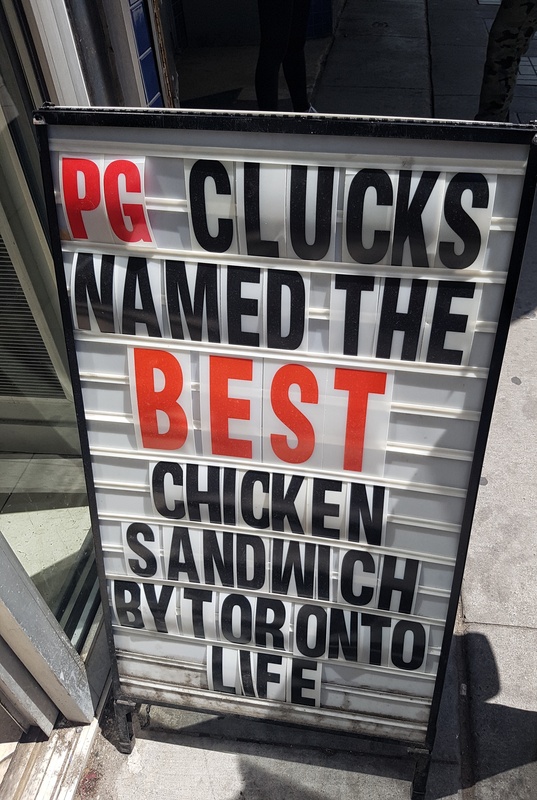 Located near College Street in downtown Toronto, PG Clucks is a street food style joint that serves anything fried chicken from crispy tenders to mouth watering burgers. There was a bit of difficulty locating the store as their sign isn’t exactly the company name, so if you’re willing to give this spot a try, be on the lookout for the sign I’ve posted below! Upon my visit, there was a shortage of staff, which meant a bit of a waiting time. However if you’re patient, you’ll be glad for the wait! 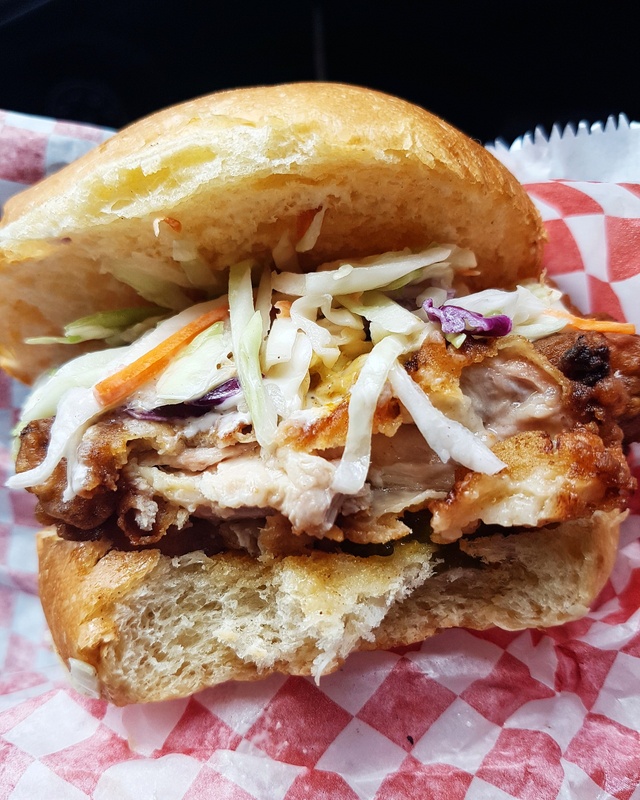 Also, due to the small size of the store, there is no seating to dine on spot unfortunately, but the food is perfectly compact enough to grab on the go. That being said, their menu is the showstealer. For a cheap price of just $7 like most their burgers, I decided to opt for their classic burger. There’s zero clean way to eat this burger, but it’s worth every messy bite. 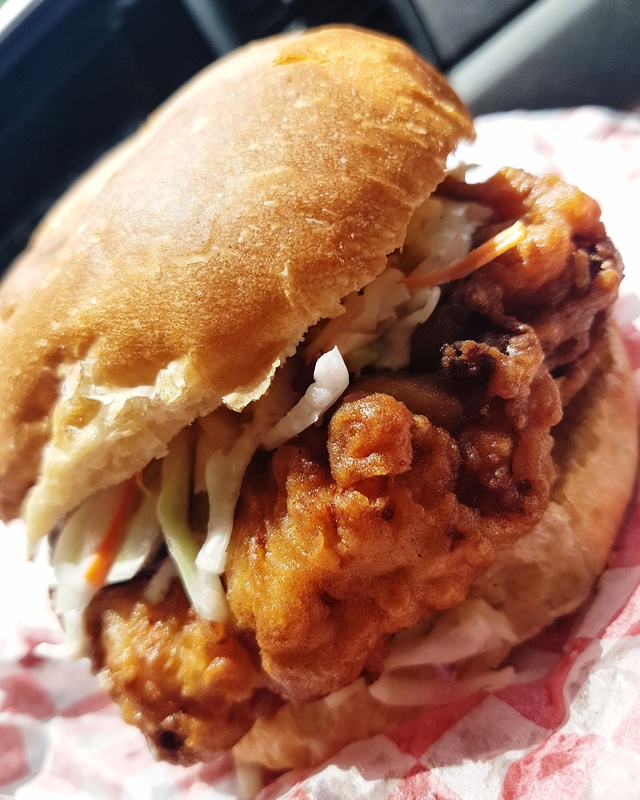 This classic burger comes with a thick fried chicken patty topped with coleslaw, pickles, smoky chili sauce, & buttermilk ranch sauce. The proportion of the burger is also perfect considering the small size being balanced out with thickness of the patty. 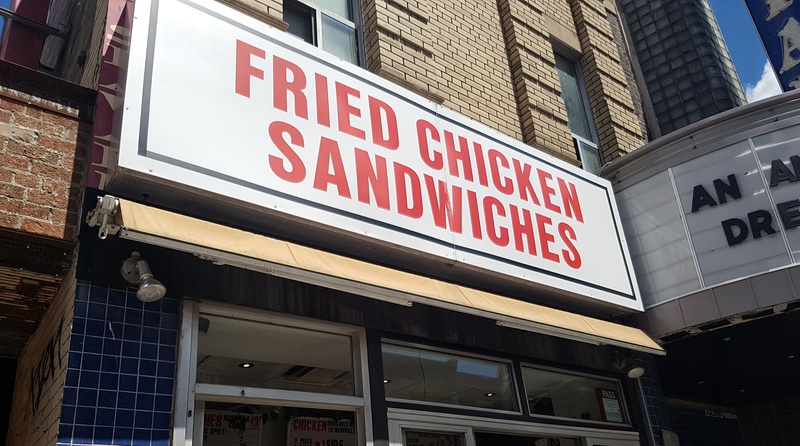 Overall, if you’re in toronto this summer and rather skip all the work of a barbeque, this is a must try summer bite approved by yours truly- S.